The Story: War Horse uses puppetry to tell the story of young Albert and his beloved horse, Joey. At the outbreak of World War I, Joey is sold to the cavalry and shipped to France, where he's soon caught up in enemy fire and on an extraordinary odyssey, serving on both sides before finding himself in no man's land. But Albert cannot forget Joey and, still not old enough to enlist, he embarks on a mission to find him and bring him home. Network with young professorials: One of the city’s most treasured entertainment institutions, Fifth Third Bank Broadway in Atlanta rolls out a new way for theatre fans to experience the best Broadway has to offer. On Thursday, September 27, the series hosts its Young Professionals networking event with Tony Award-winning play War Horse. Broadway in Atlanta has partnered with Publik to provide guests pre-show appetizers, drink specials and an opportunity to hobnob with other young professionals before enjoying one of Broadway’s best shows. The Young Professionals event takes place on September 27 at 6:30 p.m. at Publik and The Fox Theatre. Admission is $53 and includes one ticket to WAR HORSE, light appetizers, drink specials, access to giveaways and more. Use Code “PUBLIK” when purchasing tickets at Foxatltix.com/WarHorse. (Service fees may apply) Space is Limited. The puppet (Joey), which weighs 120lbs, is handmade by 14 people. Its frame is mostly cane, soaked, bent and stained. An aluminum frame along the spine, lined partly with leather for comfort, allows the horse to be ridden. Stretched, hosiery-like Georgette fabric makes up the “skin” beneath the frame. A puppeteer at the head controls the ears and head; one in the heart controls breathing and front legs; a third in the hind controls the tail and back legs. A harness connects the puppet’s and puppeteer’s spines so his or her movements become the breathing of the horse. The tail and ears are moveable instead of the lips or eyelids, because that’s how horses usually express themselves. Two levers connected with bicycle brake cables control the leather ears. The puppet, just under 10ft long and about 8ft tall, has about 20 major joints. Vertical levers curl the knees and lift the hooves. The neck is made of carbon fiber glass for flexibility. The eyes are black color behind clear resin so light refracts through them. The right hind lever moves the tail up and down; the left hind lever, left to right; moved together, it spirals. The hair in the mane and tail is made of Tyvek, a plastic-like paper. 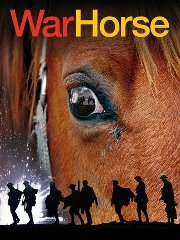 Education Resources: The story of War Horse includes elements that speak to English, Drama and History classes. You can download their resources below, which can be used by teachers, students, researchers or anyone wanting background information on War Horse and World War I, as well as curriculum based activities. To download the teacher's guide please visit:http://warhorseonstage.com.s3.amazonaws.com/files/NY_LCT_WarHorseTeacherGuide.pdf. 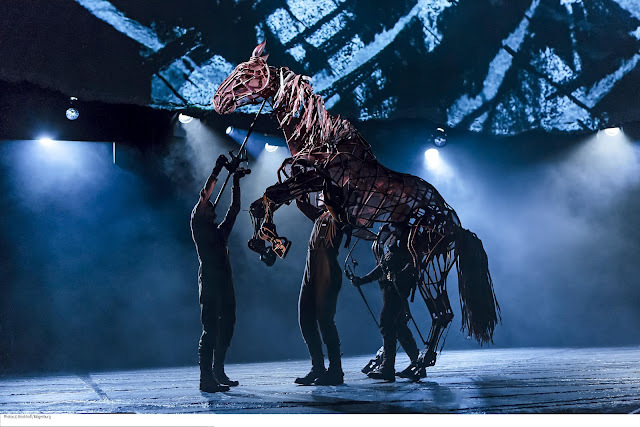 It might be you last chance to see it: War horse is the longest running tony award winning best play of the last decade. The 2011 Tony®Award-winning Best Play and international sensation seen by over 2 million people worldwide, will conclude its Broadway run Sunday, January 6, 2013.